Me (Left), Dad, and my older brother. Dad was my first hero. The best and most important lesson I have learned from my father is that I am not him. I am not him. I am not my grandfather, nor his father, nor his father. I am not them. And while it is fashionable in some circles to worship our dead* doing so means we lose not only something important from them, but from ourselves, too. Although I grew up listening to stories about my grandfather Daniel, the truth is my Dad told me very little about his own life. I've written before about the book he and I never got to write -- a memoir of sorts we were going to title Every Man Is A VIP. He told me he was waiting for me to be old enough to understand. Over the years since his death -- this September 3rd he will be gone 24 years -- I have come to different conclusions as to why he thought it was important to wait. After all, don't fathers regale their sons with stories about youth and prowess? That seemed to be the pattern of most of the fathers of the sons I went to school with, went to church with. Not that he didn't share stories about himself, but almost always they were funny stories. Most often, he was not the hero of his stories. He was never the villain either. When he told me the reason he never ate bananas he did not shy away from his own culpability. (He ate bad ones in the Navy while at port in Hong Kong... and so did the entire ship, including the Captain who ordered them NOT to eat the bananas. The entire crew ended up with dysentery... including the Captain.) When he told me the story about his military induction, he did not hold back on his feelings of inadequacy standing naked in a cold gymnasium with a thousand other young men. All men have their failures and all men have their triumphs. But for Dad, a story about him 1) was funny and 2) was educational, even and especially at his own expense. The only time he told hero stories was when he talked about his own father, who was far from perfect and probably in need of some understanding, if not revision. Men are not perfect creatures and it does us all a disservice to worship our elders to the point that they become symbols of divine infallibility. Grandpa Parsons died when I was 3, so my own memories of him are limited. Most of what I know about him, I know from stories Dad told. I learned a little more from My Dear Sweet Ma, and some from my Grandma Dunn, who knew him because they lived across the street from Dan and Minnie Parsons on S. Charity Street. He was not an easy man, though he, too, loved to tell stories. I have come to suspect that my dad's ambivalence about dogs is rooted in the fact that maybe sometimes the dogs ate better than he did. Grandpa was fond of whiskey even though (and probably because) his wife supported the temperance movement. He was also something of a flirt and probably a philanderer, which made Grandma Parsons terribly (and likely understandably) jealous. Then again, being personable isn't the same as taking your pants off and Bethel, like all small towns, has always operated more on rumor than substantiated fact. He was a stubborn and argumentative man. One of my favorite stories about him is the one in which he stopped speaking to his barber over a political argument. He still went to the barber. After all, there was only one in town. He just didn't speak to him. But he was also a man who took no guff, who did not simper and skulk. Grandpa (Clay J, Sr.) Dunn at Bantam. Grandpa Dunn died in 1988. He worked with his hands, which means he also worked with his mind. I once watched him working on a design for one of his carpentry projects. He was drawing it out on a napkin at the kitchen table. It struck me, being as young as I was and thoughtless as I was, that he was far better at complex math than I was at simple math -- and that he had dropped out of school. Most of his world was cut off from me. I was too sick to be in his workshop, too sick to wander the woods much... or at least, that was impression I was given until I was 10 or so. Most of his world was cut off from me, but the one thing I learned from him, though he spoke very little around me, was that being educated is not the same thing as knowing. And while I was being raised to embrace education, I tucked away the knowledge that there is more than one way to learn something, and that I could learn by doing as much as I could by sitting in some stale classroom, waiting to be told what is important. I keep that in mind every time I step into the classroom to teach. This lesson keeps me grounded as teacher more than any pedagogy. It wasn't until recently that began to (maybe) understand the Old Man's motivations in not telling me the rest of his stories. Every boy grows up in his father's shadow**. But there's a point where the son must extract himself from that shadow, whether it is an oppressive one or whether it is a comfortable one. A boy doesn't really become a man until he fully extracts himself from that shadow. My Old Man castes a large shadow, and so did his father, and I'm guessing that his father did before that. Dad had to leave home before he could properly see himself in the light of day. The same was true for his father. The same was true for me. I like to think now that the Old Man understood this -- that bearing down too much on a son will keep him forever in the shadow. He did not want to be worshiped. He wanted to be understood when I had the appropriate context and experience. I am not my father. But I am my father's son. I don't need to sit and wonder what The Old Man would do in any given situation because it is not my father who is in any of those situations anymore. But I can look back over what he taught me, the things he tried to tell me, and I can find my own answers. *Worshiping the dead is not the same thing as Remembrance. Remembrance implies meditation, consideration and reconsideration, paying attention, and LEARNING. To worship the dead means fitting them into whatever convenient framework makes us feel better about ourselves and our world view, no matter how incorrect that view might be. See also: every public school history textbook. See also: every sermon by James Hagee, Pat Robertson, Robert Tildon, Joel Olsteen, Jimmy Swaggart, and Oral Roberts. See also: any nightly "world" news show on a major television network. ** This is true whether the father is present or not. Absence does not negate the father. Absence just leaves more room for interpretation and selfish revision. 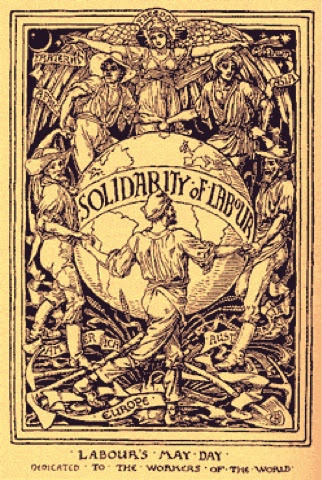 First of all, Fellow Workers of the World, let me wish you a happy May Day! For those of you who may be unaware, May 1st is when people around the world with a sense of history celebrate the contributions that labor -- both organized and oppressed -- have made to the world. May Day resonates with members of different unions in jobs both industrial and office around the world. May Day resonates with those who keep a careful eye on history and another on current events beyond the catapulted propoganda we are assaulted with from memeworld*. The above image is of an 1886 flyer. Working people in this country were fighting for an 8 hour work day -- which at that time, was labled dirty and dastardly socialism. May Day was an attempt to organize previously unorganized and already unionized (aka: harrassed) behind the single idea that people who work deserve to be treated with dignity and respect regardless of the work they do... and that the people who actually do the work deserve to see the most benefit and the most reward from that labor. Friends of mine and Fellow Wobs are gathering all over the world to celebrate today. They will sing songs -- new and old -- and put out the call yet again that the only people who can fix the problems of the world is EVERYBODY. Today, if all goes well, the Kentucky General Membership Branch of the IWW (the Industrial Workers of the World... The ONE BIG UNION) should be officially chartered. Some fellow workers are gathering in Indianapolis to celebrate and remember today - and I am with them in spirit. I am here, on the outskirts of Losantiville, planting flowers. Digging in the dirt, and laying down fresh mulch in front of My Dear Sweet Ma's place is how am choosing to celebrate May Day. It is a small thing. Certaily it is not the sort of thing I need to assume is going to be willfully ignored by the news media, as I am sure that any May Day celebration here or abroad will probably be. Planting some forget-me-nots and a few bushes may not seem like an appropriate way to celebrate what I consider to to be a historic and important day. On the other hand, I can think of no better metaphor for making the world a better place for everyone than to plant living things in the hope that they will grow. The actual work of the world is like this: small and deliberate and full of care. The actual work of the world that will ultimately change the world does not include bombs or bullets; bombs and bullets fail in the long scope of history. The actual work of the world is some people singing while others plant quiet flowers.